Because it was Monday morning and I was only on my first cup of coffee, I felt compulsive enough to pull the trigger on this cute and (clearly Bachelorette) coveted necklace. It's priced at $30, which in my book, is pretty affordable for something so unique. 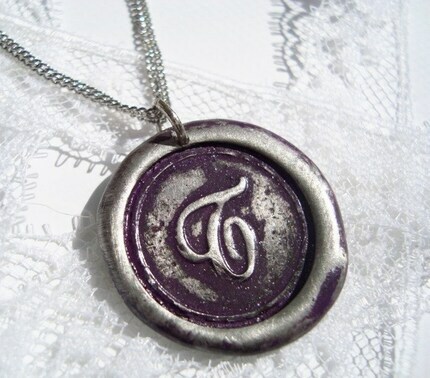 I ended up ordering the Plum colored pendant (shown above). Brooke, the genius behind RitzyMisfit, allows the buyer to select the degree of "character" of the pendant's shape - "1" being closer to perfectly round and "3" being very "imperfect" or "rough". She also asks the buyer to select the degree of color you would like. "1" being a little and "3" being extremely saturated. I chose 1 degree of character, you know since I'm too OCD to handle the "imperfect" circles, lumps, and bubbles. I then selected the 2nd degree of color, which is the same amount that Jillian has in her teal pendant shown above (or somewhere between a little and a lot). I'll be sure to post a recap when it arrives. Consider me just as impulsive. I just bought one after reading your blog! Thanks! I have been looking at a similar pendant on Etsy lately... and one other that has two initials joined. I think the two initials joined would be cute, but maybe a little too mushy (assuming I were to get it with me and Colby's initials joined). Anyway, I really like this one! Did you get your first name or last name initial? what color did you guys order?? Too cute! I love the wax seal look and how it's customizable in terms of roughness and color saturation! How nuts that an etsy seller has such an extensive celebrity clientele too! Great purchase! That reminds me I have one of those in my drawer that I purchased last summer from Ritzy Misfit - I better bust it out again soon! So cute! I really like those necklaces and the color you chose, looking forward to hearing how you like it! The ones on Ali and Jillian are great colors too. Hmm. This may be going on my Etsy wish list. Love it! I love the deep purple you choose, too!